Bruxism and clenching are certainly hot news recently, so our patients will certainly be asking for more information over the coming weeks and may be much more receptive to treatment. This time it’s the Grindcare device, available from S4S, in the Daily Mail. I still haven’t found a suitable case for this treatment, but maybe that’s because our standard appliances, properly made and adjusted, seem to do the job so well. The treatment is not cheap – a four-week Grindcare loan trial costs £180. After this, patients can buy one of the devices for £850 (this compares with a decent mouthguard, which costs £300 to £400). Have any of our readers tried this technology? We’d love to hear your comments. 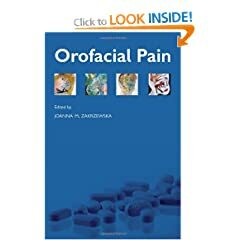 I hope to bring you a full review of this book when I’ve finished reading it, but it looks a very good read and an essential reference for anyone involved in the diagnosis and management of orofacial pain. It’s a comprehensive and timely review of the current state of play in this field, written from a British perspective (for once!) but with an internationally renowned group of contributors from Sweden, Australia, Canada and the USA. I got my copy for about £26 delivered, so you couldn’t say it was expensive for the type of book it is. Well worth considering IMHO – in-depth review to follow. Expect lots of interest in bruxism and appliances from your patients after the BBC coverage today. There are some remarkably positive comments below the article. I’m not sure where the person who reckons it would cost £5K to fix their TMJ problem got their information from, but it should make any treatment we offer look like good value at least! Warm congratulations to Drs Andrew Flatters (Radlett, Herts), Jonathan Schwarzmann (Bushey Heath, Herts), John O’Leary (Thames Ditton, Surrey) and Phil McCauley (Wimborne) for successfully completing the Advanced Restorative Seminars (ARS) Course held at South Coast Dental Specialists in Wimborne yesterday. I spent a very enjoyable day meeting their very grateful patients and seeing the final restorations fitted. There was a great mix of implants, conventional PFM crowns and bridges and bonded dentistry on show. All the delegates have reason to be justifiably proud of their achievements. It was very impressive to see the final evening presentation of “before and after” photos of their full mouth reconstruction cases and to be present as Graham Browning handed out their lovely engraved glass trophies. Sadly I had to miss the dinner that followed, but it was a nice touch that two of the patients and their families; the technical team from Water’s Edge Ceramics and the dental nurses from Graham’s practice were all able to be there. Graham and Richie now move onto the next IRS course, which started early for one lucky delegate today as he will be away during the first weekend – we’re nothing if not flexible! 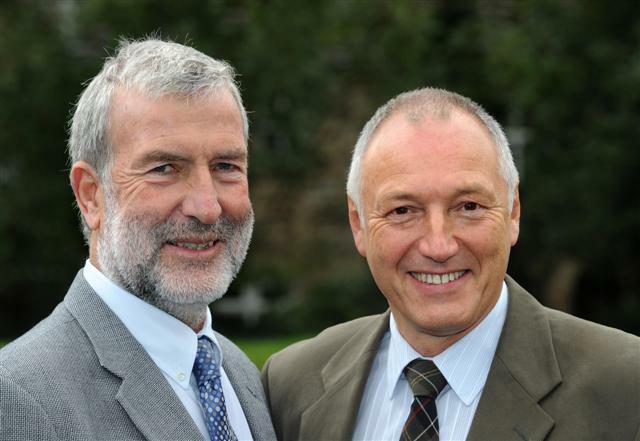 SDS Instructors Graham Browning and Richie Morgan, of Poole, are both running a half marathon in aid of Cancer Research.